Today, I talked with my follower on Video talk of my WhatsApp. He is following me for 2 to 3 months. Today, he failed to achieve his goal. So, he told me. I suggested him to buy my some paid product. If my free products are good. My paid products will great. It is the human nature, it wants to save money from good projects which give better return than that saving. Saving of money should always from bad project. If it is the matter of gaining knowledge, person should buy all educational products for achieving his goal. Now, I am connecting above para of content with my topic. Everything is free here for learning journal entries but still, there is something, I did not mentioned. For example, Still, I did not talk on "Analyzing Transaction into Debit and Credit Parts." If you have bought my paid product, it will right to know all the topics which still did not mentioned. But I know about this. One, I forgot to mention. Second, you forgot to read. So, my online course and ebook are the best solutions of this. Ok, come and understand about "Analyzing Transaction into Debit and Credit Parts"
There are billions of dollars transactions in this world everyday. Billions of journal entries passed in this world for recording this. There are billions of account which is made in billions of ledger books. 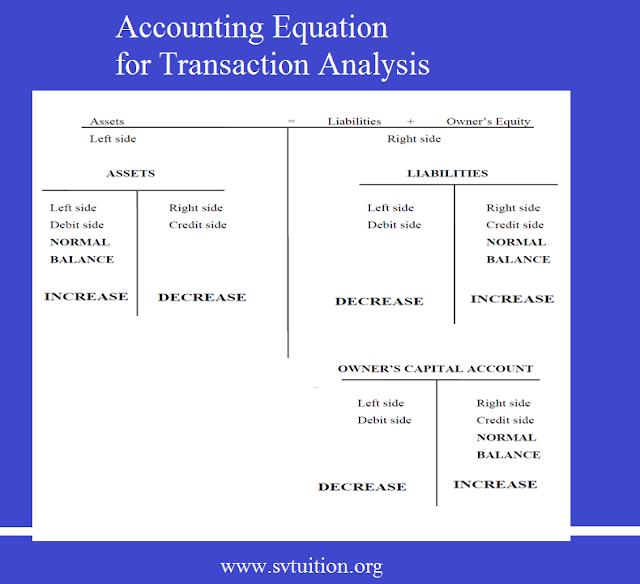 How can accountant analyze the transaction into debit and credit parts? It is important question. Accountant uses only accounting equation for this. Left Side of accounting equation is asset side. So, if the balance of asset, it is in left side and left side is also debit side. Right side of accounting equation is liability side. If there is liability balance, it will be credit side because right side is credit side. Because balance of left side of accounting equation will increase. Yes, decrease in asset will decrease the balance of asset. Because balance of asset is in the left side of accounting equation, so, it will credit side of same account. All decrease in liability will be debit side because balance and increase in liability in credit side of accounting equation. So, when we make the account of same liability, we will show debit side all the decrease in liability for counting balance of liability which will show credit balance of liability.